WestfieldBargains.com lists upcoming local garage sales as well as bargain inventory available online. It's that time of the week again - garage sale time. WestfieldBargains.com is a startup internet business. 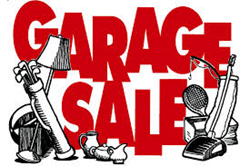 One of its intended niches is to provide garage sale listings, for no cost, to patrons wishing to advertise their upcoming garage sale (or yard sale, community sale, etc) on its specialized map. Proprietor John Connors say this: "We don't have to charge anything for folks to list their garage sale on our site, because our goal is to establish an enduring relationship with our patrons. We want them to come back to list their next garage sale and to find other garage sales local to their area, as desired." The website will also offer deeply-discounted products for sale, as available. "Right now, we're just gearing up and our inventory is very shallow, but we have to start somewhere, right?" stated Connors in a recent interview. He continues, "I often find product for nearly giveaway prices, and I can then list it on westfieldbargains.com for little or no markup. The reason I can pass along bargain pricing is that I intend to monetize the website with advertising, no product sale. This allows for a win-win situation, both for me, via advertising revenue, and for my site visitors, by way of deeply-discounted inventory."